Do you sleep with a stuffed Simba? Are you still traumatized by the death of Bambi’s mom? Have you been staring at the edge of the water as long as you can remember, never really knowing why? 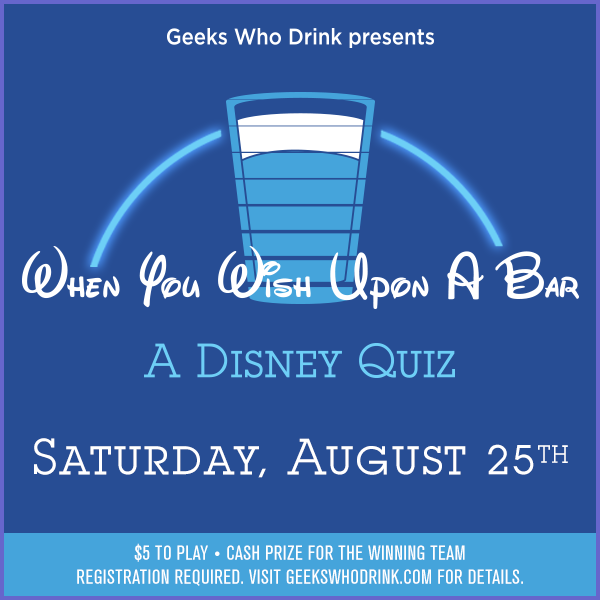 Wonder no longer because we’re bringing you the third edition of When You Wish Upon a Bar: A Disney Quiz on August 25th! Put on your glass slippers, wake up your ancestors and get to a quiz! Just like last time, the bulk of the questions will cover the theatrically released films produced by Walt Disney Animation Studios. Anything and everything Disney is fair game though, so maybe look at a map of Disney World or finish that play-through of Kingdom Hearts HD 2.8 Final Chapter Prologue. We won’t however be asking you questions about Star Wars or Marvel, so don’t worry. You’ve only got 80+ years of animated classics to watch in preparation. Check below for venues and times. Admission is $5 per person and the winners will take home the cash pot. We’re accepting cash only though, so leave those Disney Dollars at home. You might want to come prepared with more than one team name, though, because “The Happiest Quiz on Earth” will likely go fast. Quiz starts at 4 p.m. in the B. Nektar taproom- 1511 Jarvis, Ferndale, MI. Your team is required to register for this quiz by visiting http://bit.ly/GWDDisneyReg.